Love Potion is a richly saturated dark, hot pink when cold, and almost clear when warm, with a gorgeous light gold microflake shimmer overlay. The formula was utter perfection, of an ideal thickness requiring minimal cleanup, and only 2 coats for the opacity you see here. It also magically wore like iron, with only very minor edgewear after 4+ days (a total miracle given how obvious any chips/wear would be with this dramatic color at the tips). As it warmed up, I'd get the full range of pinks lightening toward clear, with a bit of the hot pink lingering as a french tip effect. 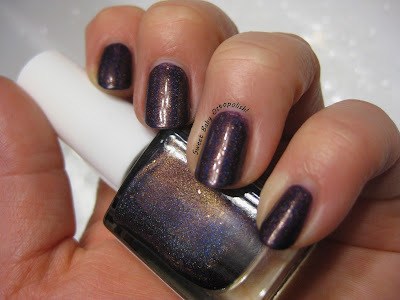 One of my top picks from Femme Fatale's 2015 Snow White collection was the very pretty Art of Witchcraft, the holo be-glittered version of that same collection's Poisoned Apple. Then some discussions with other FF aficcionados convinced me that Poisoned Apple miiiight actually be a different color altogether, one lighter and more aqua-teal rather than deep slate-teal. Spoiler alert: nope, same color. In all these swatches, Art of Witchcraft is in 3 coats on my ring finger, with Poisoned Apple in 3 on the rest. PA is a dark slate-teal with a prominent almost-red magenta shimmer. The shimmer has a subtle duochrome shift up to green (which is basically only captured in this bottle shot, and which was never visible to me in AoW either time I've worn it), and there's a delicate scattering of silver microglitter in there too. For my birthday, I busted out my birthday month polish, March 2015 from Enchanted. March 2015 is a variant on a frequent theme in my collection - blue with pink flash. In this iteration, we have a veeerrrrry slightly greyed aquamarine, a subtle barbie pink shimmer, and a very fine-particle linear holo. 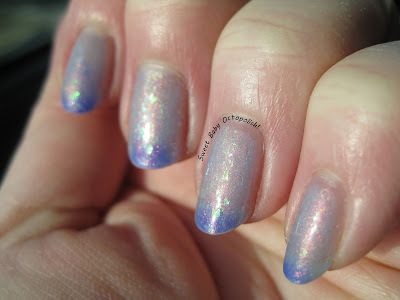 This bottle is a whole lot more toned-down than similarly-composed things like Orly Angel Rain or CBL Katarina. I think it's the little touch of grey in the color, but March 2015 had just a bit of a chameleon tendency to look different in different lighting, sometimes more grey or more blue or more minty aqua. The grey also helps make sure that the cool pastel doesn't give one the dreaded lobster-hands, and I think means it's wearable by more skin tones. Sometimes, I find new-to-me brands while perusing destashes, with colors I've never heard any hype about, just waiting to be picked up. Case in point - Fancy Gloss Emerald City. Emerald City is a tonal green thermal jam-packed with soft gold microflake shimmer. The quantity of shimmer makes the polish have a thickness that means there's almost no cleanup needed, and the visual texture is nicely concealing of any imperfections of your nails. At it's coldest on me, EC is a bright kelly green, full of sparkle and flash. At it's warmest, it's a borderline neon yellowy spring green. Since some other swatch pics I've seen have this more truly emerald green when cold and much closer to clear when warm, I'm suspicious that this is actually a dying thermal, settling a bit between the 2 colors instead of showing its full transition range. Fortunately, it's still plenty pretty, and I got the fun french tip effect plenty of the time. 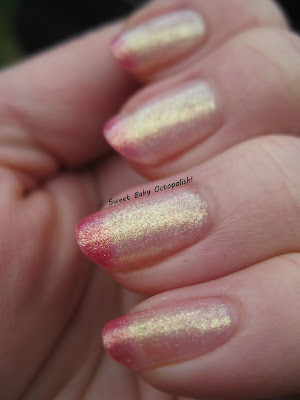 The first time I saw a swatch pic of Celestial's Bay of Rainbows, I knew it was headed home as soon as I could snap up a bottle. Bay of Rainbows is a gorgeously deep emerald green jelly filled with an assortment of metallic glitter: there's large holo circles and stars, smaller blue and green circles, and a smattering of gold microglitter. The jelly formula was smooth and easy to work with; I put it over a peel-off basecoat, so only wore it for just under 48h and only have a handful of pics. I'm wearing 2 coats here, which left me with a few uneven places in the jelly (visible in pics but not at all IRL). The glitter placement looked too nice at this point for me to bulk it up by adding a 3rd coat. 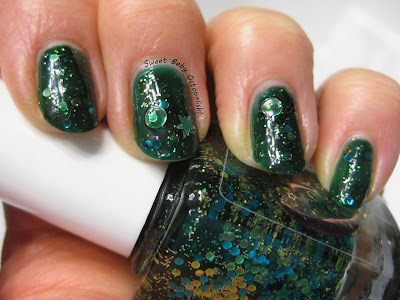 For the next week leading into St Paddy's, it's all green nail polish from here out! Femme Fatale mused on her fb group a while back that she was thinking of doing a collection of polishes with contrasting shimmers, with a call for suggestions from the fans. Around the same time, the January color of the month was born as one of the type in question. Morning Glory is a very springtime-fresh pale yellowy green, with a bright turquoise shimmer overlay. In certain lighting, the yellow and aqua combo did lobster-hand me a little, but most of the time things were just fine. Last Halloween, Color 4 Nails released a holiday box full of exclusives, and I was lucky enough to find someone destashing the one in that box I just had to have, Celestial's Under Full Moon Light. Moon Light is a rich purple, somewhere between eggplant and amethyst, with a gorgeous bronze shimmer overlay and a scattering of bronze metallic-looking flakies. There's a lightly sparkling linear holo arc here that's prominently blue, plus the flash in the center is bronze from the shimmer. Fire & ice on a warm purple background, mmmm. When things aren't bright enough to catch the holo flare, the golden bronze flakies come to the foreground. If you paint with a heavier hand than I do, this could be a one-coater. My usual 2 thin coats covered with perfect opacity, and the formula was flawlessly self-leveling. 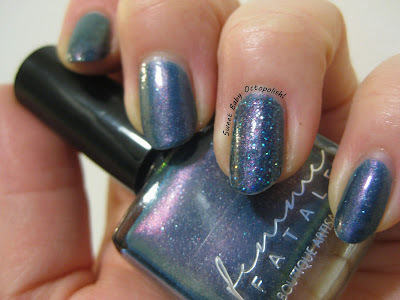 When Femme Fatale announced last year that her next collection was going to be based off of the sci-fi epic Dune, I was swoony...and when the swatch pics of Blue-Within-Blue Eyes were dropped on an unsuspecting world, I was knocked dead. On my nails? Absolutely no disappointment to be found. BWBE is a gorgeous royal blue thermal that warms up to a sheerly translucent periwinkle, overlaid with a red shimmer that pulls the tone a little toward violet, and mixed in with iridescent blue-to-green flakies. 2 coats gives good opacity while the color is cold, but I think it'd take a whole lot bordering on impossible to get it completely opaque while warm, so this is one for people that enjoy the soft veil of color that is this polish's warm state. Last year, Color 4 Nails started carrying CrowsToes, and celebrated the launch with a trio of store exclusives. My top pick of the three is Quietus. At first glance, Quietus is a smoky, silvery purple, with a bit of added sparkle, and indeed it does hit a lovely rich amethyst in bright, direct sunlight. All in all, it's rich and stunning. Totally opaque in 2 coats with a slightly thick (but in a good way) formula, its only downside was chipping in ~2 days. And that shift, just wow.